The Staples girls lacrosse team celebrates its 15-12 victory at Greenwich Friday. 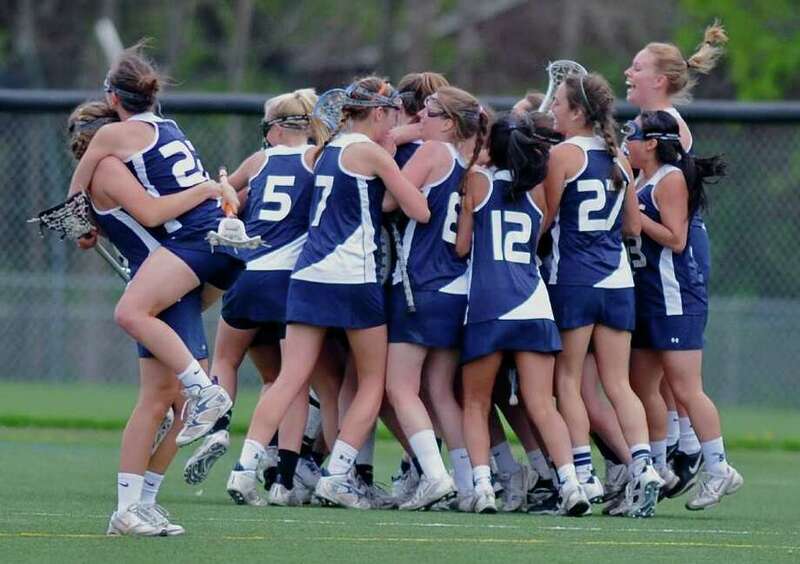 In the world of lacrosse, Westport usually takes a back seat to Greenwich. The Staples High girls lacrosse team had never beat the Cardinals in the seven-year tenure of Wreckers' head coach Cathy Schager. So when Staples engineered a nine-goal second half to upend the Cardinals 15-12 in Greenwich on Friday, emotions on both sidelines were at polar opposites. "We don't pack it up, that's one thing that's become true this season," Schager said of her team, which overcame a four-goal first-half deficit to remain undefeated (9-0, 5-0 FCIAC) and tied atop the FCIAC with Wilton. Staples' comeback started late in the first half and the momentum snowballed on Greenwich, which could not regain control of the action. The Wreckers' defense suffocated the Cardinals in the second half, holding Greenwich to three goals on just seven shots after connecting on nine of 16 attempts in the first half. The Wreckers grabbed its first lead of the game with 8:42 left in the second half. Maeve Flaherty, cutting to the front of the net, corralled Nikki Seo's pass from behind the goal and beat Hannah Jeffrey to put Staples up 12-11. Although it took 41 minutes to claim the lead, Seo, a senior captain, was confident her team would prevail before the opening faceoff. "Right when we started warm ups, I didn't think we needed a turning point," Seo said. "We trust each other, know how to play and that's where the fire came from." The Cardinals struggled to contain Staples' speedy trio of Flaherty, Seo and Ali Crofts. The three were involved in 13 of the Wreckers' 15 goals -- either scoring or assisting on the play. Elizabeth Driscoll gave the Wreckers a two-goal advantage, 13-11, with an overhand shot as she charged the net off a curl at 46:20. Turnovers late in the game thwarted Greenwich's chances of holding off Staples or engineering a comeback. After senior quad-captain Shannon Colligan drew a charge to get Greenwich a much-needed possession while clinging to a one-goal lead, the Cardinals turned the ball over on offense. Staples tied the game, 11-11, on the ensuing possession when Adele Mackey converted a free position following a three-second call at 39:40. Trailing by two inside three minutes to play, Greenwich's pressure forced a turnover. However, Izzy Mackell's clear attempt was tipped and intercepted by Jesse Ambrose, directly resulting in a goal off a free position by Seo. Seo's fourth goal gave Staples a 14-11 lead with 2:10 to play. Flaherty and Crofts each chipped in three goals for the Wreckers. Seo and Flaherty each had three assists. Tori Dunster, Claire Feeney, Emily D'Erosmo and Emma Christie led the Cardinals with two goals, apiece. Colligan posted a goal and two assists. Six different Cardinals scored in the first half as Greenwich jumped out to a 6-2 lead. Staples battled back and cut the lead to 9-6 at the break.